We must decide whether a poetic account of the O.J. Simpson double murder trial entitled The Cat NOT in the Hat! 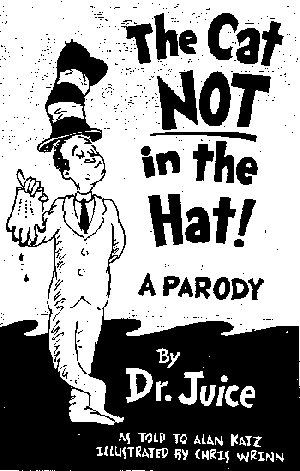 A Parody by Dr. Juice, presents a sufficient showing of copyright and trademark infingement of the well-known The Cat in the Hat by Dr. Seuss. Penguin Books USA, Inc. ("Penguin") and Dove Audio, Inc. ("Dove") interlocutorily appeal the district court's preliminary injunction prohibiting the publication and distribution of The Cat NOT in the Hat! A Parody by Dr. Juice, a rhyming summary of highlights from the O.J. Simpson double murder trial, as violating copyrights and trademarks owned by Dr. Seuss Enterprises, L.P. ("Seuss"), particularly from the book The Cat in the Hat. Seuss, a California limited partnership, owns most of the copyrights and trademarks to the works of the late Theodor S. Geisel, the author and illustrator of the famous children's educational books written under the pseudonym "Dr. Seuss." Between 1931 and 1991, Geisel wrote, illustrated and published at least 47 books that resulted in approximately 35 million copies currently in print worldwide. He authored and illustrated the books in simple, rhyming, repetitive language, accompanied by characters that are recognizable by and appealing to children. The characters are often animals with human-like characteristics. In The Cat in the Hat, first published in 1957, Geisel created a mischievous but well meaning character, the Cat, who continues to be among the most famous and well recognized of the Dr. Seuss creations. The Cat is almost always depicted with his distinctive scrunched and somewhat shabby red and white stove-pipe hat. Seuss owns the common law trademark rights to the words "Dr. Seuss" and "Cat in the Hat," as well as the character illustration of the Cat's stove-pipe hat. Seuss also owns the copyright registrations for the books The Cat in the Hat, The Cat in the Hat Comes Back, The Cat in the Hat Beginner Book Dictionary, The Cat in the Hat Songbook, and The Cat's Quizzer. In addition, Seuss has trademark registrations for the marks currently pending with the United States Trademark Office. Seuss has licensed the Dr. Seuss marks, including The Cat in the Hat character, for use on clothing, in interactive software, and in a theme park. In 1995, Alan Katz and Chris Wrinn, respectively, wrote and illustrated The Cat NOT in the Hat! satirizing the O.J. Simpson double murder trial. Penguin and Dove, the publishers and distributors, were not licensed or authorized to use any of the works, characters or illustrations owned by Seuss. They also did not seek permission from. Seuss to use these properties. Wickedly clever author "Dr. Juice" gives the O.J. Simpson trial a very fresh new look. From Brentwood to the Los Angeles County Courthouse to Marcia Clark and the Dream Team. The Cat Not in the Hat tells the whole story in rhyming verse and sketches as witty as Theodore [sic] Geisel's best. This is one parody that really packs a punch! Seuss alleged that The Cat NOT in the Hat! misappropriated substantial protected elements of its copyrighted works, used six unregistered and one registered Seuss trademarks, and diluted the distinctive quality of its famous marks [LINK TO PHOTOS OF BOOK COVERS]. Katz subsequently filed a declaration stating that The Cat in the Hat was the "object for [his] parody" and portions of his book derive from The Cat in the Hat only as "necessary to conjure up the original." Seuss incorporated additional infringement claims from other Dr. Seuss texts - Horton Hatches the Egg and One Fish Two Fish Red Fish Blue Fish - in its request for injunctive relief. On March 21, 1996, the district court granted Seuss' request for a preliminary injunction. About 12,000 books, at an expense of approximately S 35,500, had been printed to date but now were enjoined from distribution. Penguin and Dove brought a motion for reconsideration and Katz filed a second declaration admitting to drawing from the other two Dr. Seuss works. Seuss then withdrew its claim regarding an illustration from Horton for purposes of its motion for injunctive relief. We must first determine whether The Cat NOT in the Hat! infringes on Seuss' rights under the Copyright Act of 1976, 17 U.S. C. @ 106. Seuss, as the owner of the Dr. Seuss copyrights, owns the exclusive rights (1) to reproduce the copyrighted work; (2) to prepare derivative works based on the copyrighted work; (3) to distribute copies or phonorecords of the copyrighted work to the public; (4) to perform the work publicly; and (5) to display the copyrighted work publicly. @ 106. Seuss alleges that Penguin and Dove made an unauthorized derivative work of the copyrighted works The Cat in the Hat, The Cat in the Hat Comes Back, The Cat's Quizzer, The Cat in the Hat Beginner Books Dictionary, and The Cat in the Hat's Song Book in violation of @@ 106 and 501. Most courts have used some form of bifurcated test to demonstrate "substantial similarity," inquiring first if there is copying and second if an audience of reasonable persons will perceive substantial similarities between the accused work and protected expression of the copyrighted work. "The Cat in the Hat" is the central character in the original work, appearing in nearly every page of the Dr. Seuss work (26 times). Penguin and Dove appropriated the Cat's image, copying the Cat's Hat and using the image on the front and back covers and in the text (13 times). We conclude that substantial similarity exists on an objective and subjective level (see attachments # I and # 2). Penguin and Dove, however, maintain that they have not infringed on any one of Seuss' exclusive rights of copyright because The Cat NOT in the Hat! employed elements of the copyrighted work that are either uncopyrightable or that have Men into the public domain. Penguin and Dove's argument is based on an analytic dissection of the following elements: (1) infringement cannot be based on the title of the parody because it is "clear, as a matter of statutory construction by the courts that titles may not claim statutory copyright. "; (2) the design of the lettering of the words used in the accused work cannot be found to infringe, because Congress decided not to award copyright protection to design elements of letters; (3) the poetic meter used in Cat in the Hat known as anapestic tetrameter is no more capable of exclusive ownership than its well-known counterpart, iambic pentameter; (4) no claim of ownership may be based on the whimsical poetic style that employs neologisms and onomatopoeia. Illustration using line drawing, coloring, and shading techniques similar to those used in The Cat in the Hat are not copyrightable. However, this kind of analytic dissection is not appropriate when conducting the subjective or "intrinsic test" (asking if an "ordinary reasonable person" would perceive a substantial taking of protected expression). Even if Seuss establishes a strong showing of copyright infringement on these facts, Penguin and Dove maintain that the taking would be excused as a parody under the fair use doctrine. The fair use defense "permits courts to avoid rigid application of the copyright statute when, on occasion, it would stifle the very creativity which that law is designed to foster." In @ 107 of the 1976 Copyright Act, Congress laid down four factors to be considered and weighed by the courts in determining if a fair use defense exists in a given case: (1) the purpose and character of the accused use; (2) the nature of the copyrighted work; (3) the importance of the portion used in relation to the copyrighted work as a whole; and (4) the effect of the accused use on the potential market for or value of the copyrighted work. Congress viewed these four criteria as guidelines for "balancing the equities," not as "definitive or determinative" tests. Congress observed that "since the doctrine [of fair use] is an equitable rule of reason, no generally applicable definition is possible." The four fair use factors "are to be . . . weighed together, in light of the objectives of copyright 'to promote the progress of science and the useful arts.'" We now examine each factor. The first factor in a fair use inquiry is "the purpose and character of the use, including whether such use is of a commercial nature or is for nonprofit educational purposes." While this inquiry does not specify which purpose might render a given use "fair," the preamble to @ 107 provides an illustrative, though not limitative, listing which includes "criticism, comment, news reporting, teaching (including multiple copies for classroom use), scholarship, or research." Under this factor, the inquiry is whether The Cat NOT in the Hat! merely supersedes the Dr. Seuss creations, or whether and to what extent the new work is "transformative," i.e., altering The Cat in the Hat with new expression, meaning or message. Parody is regarded as a form of social and literary criticism, having a socially significant value as free speech under the First Amendment. This court has adopted the "conjure up" test where the parodist is permitted a fair use of a copyrighted work if it takes no more than is necessary to 11recall" or "conjure up" the object of his parody. Accordingly, the critical issue under this factor is whether The Cat NOT in the Hat! is a parody. For the purposes of copyright law, the nub of the definitions, and the heart of any parodist's claim to quote from existing material, is the use of some elements of a prior author's composition to create a new one that, at least in part, comments on that authors works.... If, on the contrary, the commentary has no critical bearing on the substance or style of the original composition, which the alleged infringe merely uses to get attention or to avoid the drudgery in working up something fresh, the claim to fairness in borrowing from another's work diminishes accordingly (if it does not vanish), and other factors, like the extent of its commerciality, loom larger. The Court pointed out the difference between parody (in which the copyrighted work is the target) and satire (in which the copyrighted work is merely a vehicle to poke fun at another target): "Parody needs to mimic an original to make its point, and so has some claim to use the creation of its victim's (or collective victims) imagination, whereas satire can stand on its own two feet and so requires justification for the very act of borrowing." As Justice Kennedy put it in his concurrence: "The parody must target the original, and not just its general style, the genre of art to which it belongs, or society as a whole (although if it targets the original, it may target those features as well)." These stanzas and the illustrations simply retell the Simpson tale. Although The Cat NOT in the Hat! does broadly mimic Dr. Seuss' characteristic style, it does not hold his style up to ridicule. The stanzas have "no critical bearing on the substance or style of' The Cat in the Hat. Katz and Wrinn merely use the Cat's stove-pipe hat, the narrator ("Dr. Juice), and the title (The Cat NOT in the Hat!) "to get attention" or maybe even "to avoid the drudgery in working up something fresh." While Simpson is depicted 13 times in the Cat's distinctively scrunched and somewhat shabby red and white stove-pipe hat, the substance and content of The Cat in the Hat is not conjured up by the focus on the Brown-Goldman murders or the O.J. Simpson trial. Because there is no effort to create a transformative work with "new expression, meaning, or message," the infringing works commercial use further cuts against the fair use defense. The second statutory factor, "the nature of the copyrighted work," recognizes that creative works are "closer to the core of intended copyright protection" than informational and functional works, "with the consequence that fair use is more difficult to establish when the former works are copied." While this factor typically has not been terribly significant in the overall fair use balancing, the creativity, imagination and originality embodied in The Cat in the Hat and its central character tilts the scale against fair use. The third factor asks whether "the amount and substantiality of the portion used in relation to the copyrighted work as a whole," are reasonable in relation to the purpose of the copying. This factor really raises the question of substantial similarity discussed in the preceding section, rather than whether the use is "fair." Penguin and Dove appropriated the Cat's image, copying the Cat's Hat and using the image on the front and back covers and in the text (13 times). We have no doubt that the Cat's image is the highly expressive core of Dr. Seuss' work. Hmm. . . take the word JUICE. 'Cause if the Cat didn't do it? The Parody is a commentary about the events surrounding the Brown/Goldman murders and the O.J. Simpson trial, in the form of a Dr. Seuss parody that transposes the childish style and moral content of the classic works of Dr. Seuss to the world of adult concerns. The Parody's author felt that, by evoking the world of The Cat in the Hat, he could: (1) comment on the mix of frivolousness and moral gravity that characterized the culture's reaction to the events surrounding the Brown/Goldman murders, (2) parody the mix of whimsy and moral dilemma created by Seuss works such as The Cat in the Hat in a way that implied that the work was too limited to conceive the possibility of a real trickster "cat" who creates mayhem along with his friends Thing I and Thing 2, and then magically cleans it up at the end, leaving a moral dilemma in his wake. We completely agree with the district court that Penguin and Dove's fair use defense is "pure shtick" and that their post-hoc characterization of the work is "completely unconvincing." The fourth fair use factor is "the effect of the use upon the potential market for or value of the copyrighted work." Under this factor, we consider both the extent of market harm caused by the publication and distribution of The Cat NOT in the Hat! and whether unrestricted and widespread dissemination would hurt the potential market for the original and derivatives of The Cat in the Hat. The Second Circuit has characterized this factor as calling for the striking of a balance "between the benefit the public will derive if the use is permitted and the personal gain the copyright owner will receive if the use is denied. The less adverse effect that an alleged infringing use has on the copyright owner's expectation of gain, the less public benefit need be shown to justify the use." The good will and reputation associated with Dr. Seuss' work is substantial. Because, on the facts presented, Penguin and Dove's use of The Cat in the Hat original was nontransformative, and admittedly commercial, we conclude that market substitution is at least more certain, and market harm may be more readily inferred. Since fair use is an affirmative defense, Penguin and Dove must bring forward favorable evidence about relevant markets. Given their failure to submit evidence on this point, instead confining "themselves to uncontroverted submissions that there was no likely effect on the market for the original," we conclude that "it is impossible to deal with the fourth factor except by recognizing that a silent record on an important factor bearing on fair use disentitles the proponent of the defense." In fight of the fair use analysis, we conclude that the district court's finding that Seuss showed a likelihood of success on the merits of the copyright claim was not clearly erroneous. Hey now I'm free -- give back my glove!